The owners of a newly renovated 30,000 SF historic office building in downtown, 330 Railroad Avenue LLC, of Greenwich, are pre-building three high-end contemporary office suites to accommodate tenants that have a near-term need for high tech office space. 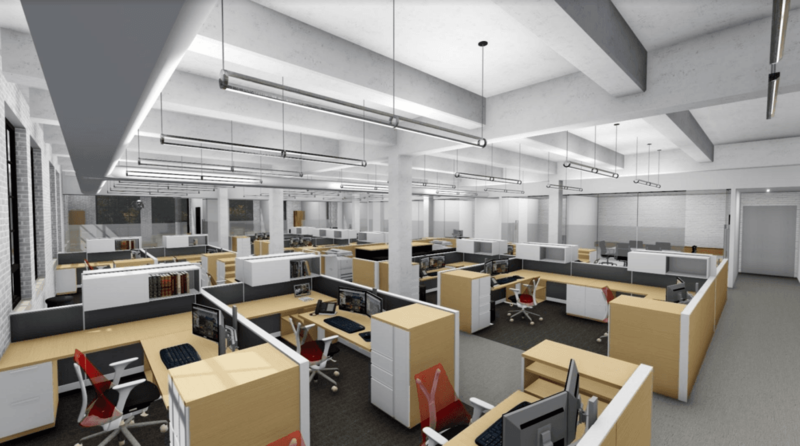 The office suites will range in size from 2,400 square feet to 3,400 square feet, with Class A+ finishes including 12-14 foot ceilings, exposed brick walls, open ceiling plans, glass front offices and conference rooms, and open-plan pantry/kitchen areas. The suites are being built to highlight the “industrial-chic” look and feel of the renovated 1928 structure, and will be available for occupancy in July. This Art-Deco inspired landmark building is just two blocks from the Greenwich train station, has been listed on the Connecticut Register of Historic Places, and will be the new headquarters of Granoff Architects, who will be moving in next month when the building officially opens. The former industrial building is in the final stages of a complete renovation that will restore and preserve the historic façade design and include all new HVAC, electric service, elevator, plumbing, historic replacement windows, solar roof panels, extensive site work and both indoor and outdoor parking. The interior of the building features 12-14 foot ceiling heights, exposed brick walls, concrete floors and will feel like high-tech office buildings more commonly found in Soho, Tribeca and Brooklyn, New York. The building is a candidate for LEED Gold certification due to its environmentally sensitive renovation process and sustainable design features. The property was sold in March 2016 by Eversource Energy to 330 Railroad Avenue LLC, whose principals are local investor/developers, Richard Granoff and Jeffrey B. Mendell. For leasing information please visit www.330railroad.com, or call Allan Murphy of NGKF at 203.531.3634.